Medicaid Won't Cover Medical Marijuana For Pain : Shots - Health News Though medical marijuana is legal in most states, some patients still have a hard time affording it. The federal government won't allow states to cover medical marijuana with Medicaid dollars. 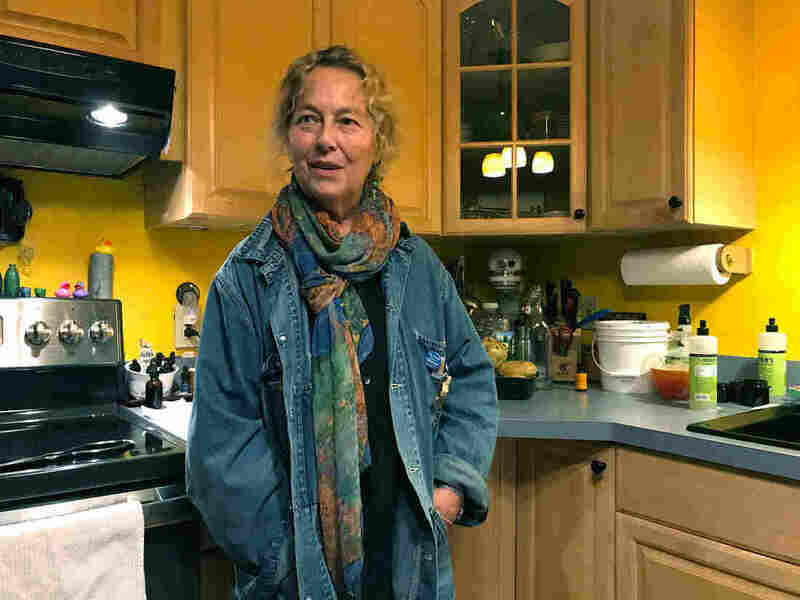 MaryJane Sarvis, an artist in Shaftsbury, Vt., weaned herself from the opioid painkillers she was prescribed for chronic nerve pain. "I felt tired all the time and I was still in pain," she says. Marijuana works better for her, but costs $200 per month out-of-pocket. Recent scientific reviews have found substantial evidence that marijuana can be useful in easing at least some types of chronic pain. Yet even for the majority of Americans who live in states that have legalized medical marijuana, choosing opioids can be much cheaper. "I can get a bottle of opioids for a dollar on my state insurance," says MaryJane Sarvis, a textile artist in Shaftsbury, Vt. Instead, Sarvis says, she spends around $200 each month on medical marijuana. Sarvis has permanent nerve pain from a childhood spine surgery. At 12, a doctor fused 10 of her vertebrae together in what she says was then a state-of-the-art effort to treat scoliosis. Thirty years later, the disks started breaking down. Her doctors told her she'd be on opioids for the rest of her life. For nearly a decade, Sarvis went from pain clinic to pain clinic. Some prescribed Vicodin, a combination of acetaminophen and the opioid hydrocodone. Others prescribed methadone, a synthetic opioid more often used to treat addiction. The drugs didn't seem to help. "I felt tired all the time and I was still in pain," Sarvis says. Last year, Sarvis detoxed from the opioids as an experiment, to see if she would get better relief from simply using marijuana. It worked. She has less pain and more energy, she says. But now, the pain is in her pocketbook. Unlike with the opioids, Sarvis has to pay for her medical marijuana out-of-pocket, with money she says she doesn't have. "I just got food stamps and I'm really freakin' relieved," she says. "Let's put it that way." The ultrafancy scarves and capes Sarvis designed used to be sold at Bergdorf Goodman, she says, adding that Oprah Winfrey and Diane Sawyer have worn her designs. But opioid painkillers contributed to the demise of her business; she was too tired and too much in pain to work. Although Vermont does require dispensaries to offer discounts for low-income patients, those price reductions are small and not consistently available. Sarvis thinks Medicaid should cover her medical marijuana, the same way it covered her opioids. "There's really no mechanism in Medicaid to do that," says Dr. Scott Strenio, who administers the Medicaid program for the state of Vermont. He says the federal government won't allow states to cover medical marijuana with Medicaid dollars, "by virtue of [it] being a Schedule I agent. That's, I think — that's the sticking point." The federal Justice department's classification of marijuana as a Schedule I drug — in the same category as heroin and LSD — means that, according to the department, it has "no currently accepted medical use." A recent statement by Attorney General Jeff Sessions suggests federal agents hope to make it harder, not easier, for Americans to use marijuana. In the meantime, MaryJane Sarvis is trying to find a solution she can afford: She's learning how to grow marijuana plants herself. There's a "huge learning curve," she says, and start-up costs run at least $1,000. That's a lot of money and effort for Sarvis. Still, she hopes that growing her own marijuana will eventually prove cost-effective.